This stair climbing cart combines an all-terrain three-wheel chassis with a folding hand cart.The stair climber cart is designed for carrying groceries, luggage and laundry up and down the stairs. Bearings that will hold up to the rigors of modern life, and developed on a modular folding chassis that will shape itself to the unique challenges of objects in different environments and on different surfaces.It can be folded that it very convenient to carry and use. Folded that it very convenient to carry and use. Decreases pressure applied on supporting surfaces. Made of carbon steel material makes stair cart more firmly and balanced. The climber makes transport and storage easy, painless, and hassle free. Folding design for easy storage. Solid rubber wheels. Fitted with comfortable rubber handles. 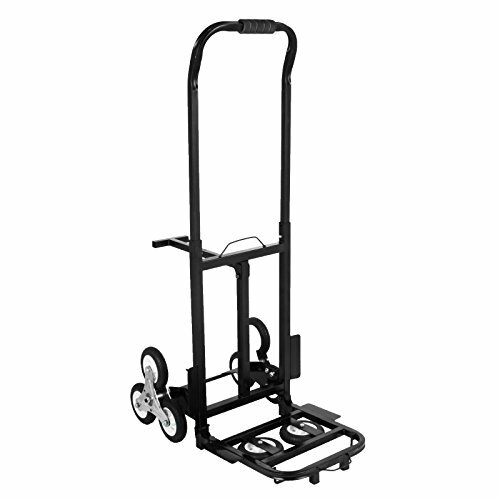 The Stair Climbing Folding Cart is perfect for carrying groceries, luggage and laundry up and down the stairs. Height adjustable handle allows you to select the optimum height for both stairs and level surfaces to minimize strain and help reduce the risk of fatigue and injury.